What can a man wear with cuban heels? Well. Put simply the answer is confidence. Men are in a world where they can now wear whatever they want but if anyone does wonder about men in heels let us start with a history lesson. Ninth century Persian soldiers going to war were known to wear heels on horseback. The heel on a mans boot was functional at this point for standing strong in stirrups whilst on a horse. The heel allowed a stance enabling the soldier to pull back the arrow and fire. This is the first depiction of men in heels which was found on a ceramic bowl. The idea came across to the west when all things Persian became fashionable. The French aristocracy popularised heels for men and one need only consider Louis XIV and his whopping (10cm) high heels to illustrate this. The fact that he could do nothing was testament to his status as a royal. He even dyed the soles of the shoes he wore with red dye as this was the most expensive money could buy. Louboutin, we know where you got the idea from! Over the years, heels became the domain of women in the main. However, the 60s and the freedom that came with it became a hot bed of experimenting and changing styles. At this point the Kings Road was heaving with trend setters wanting to emulate the rock legends who were wearing the chelsea boot at the time. It was The Beatles who went to Anello and Davide (esteemed shoemakers) and asked for the chelsea to be made with a cuban heel. Now the origin of this heel is of course Latin American. Male dancers wore cuban heeled shoes and boots to perform the tango or flamenco. So why not create some drama with your look. If we think about the 60s and the icons we mentioned and also the mod scene, we can reference how a really sharp tailored suit in charcoal or grey would look with black cuban heel boots. There are many men who can wear a suit today with cuban heel shoes or boots and ooze confidence and style. We would recommend a good fit in terms of the suit and tapered trousers or slim fit as the cuban heels tend to have an elegant long silhouette which needs a streamline outfit to compliment it. Of course, if you want traditional, this is not for you but you can look super smart yet cool original with this style. 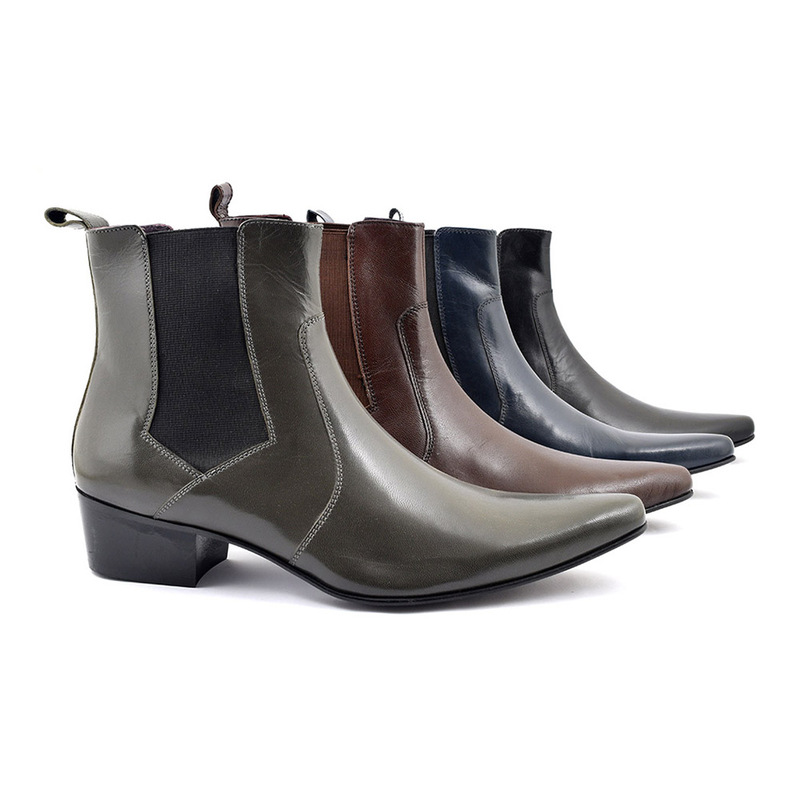 The indie look sits perfectly with this style of boot. Look back to Jagger and now to The Horrors, Noel Fielding with Bowie and Prince in between, we can see the subversive underground look you can get with this boot. Think tight skinny jeans and a loose shirt with a buckle belt in between. A loose scarf dangling around the neck and a leather jacket to hand to throw over it. Go forth and enjoy!